Dimensions 0.25 by 7.50 by 9.75 in. Amazon.com description: Product Description: This briefing is aimed primarily at executives with no particular background in software. This audience includes vice presidents with responsibility for several functional areas, one of which is software; division general managers directing all functions within a profit center; and chief executive officers. We contend that a general executive without professional experience in software development can oversee this function. This briefing helps you sort out the knowledge you need to operate effectively at your level. This executive briefing covers the two aspects of software development that you need to concern yourself with. One is progress of individual projects. The other is the long-run improvement of the software process. 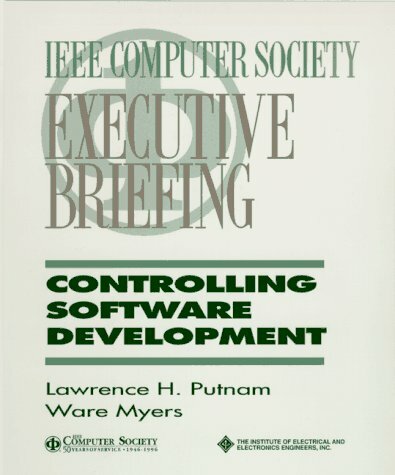 This text deals with software development both at the project-control level and the process-investment level in a degree of detail that the overburdened executive has time to accommodate. About: This briefing is aimed primarily at executives with no particular background in software.